Your physiotherapy treatment will depend on your needs, preferences and stage of healing. You may also benefit from the gentle osteopathic tissue balancing approach. CST is a gentle manual therapy (using the hands) technique, which was developed by an American osteopathic physician about 80 years ago. The craniosacral system exists in humans and animals that possess a brain and spinal cord. Although the system includes the bones of the skull, face and mouth, it extends via membranes to the sacrum. Craniosacral rhythm can be felt throughout the body and is affected negatively by trauma and inflammation. Examination is done by testing for movement in various parts of the system. Treatment is aimed at gently removing restrictions both within the craniosacral system and throughout the whole body. The goal is to balance the central nervous system and the surrounding body structures in order to restore function and decrease pain. 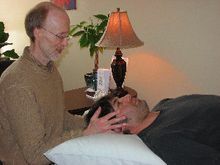 For more in-depth information on our Craniosacral Therapy, please visit www.upledger.com. This is a specialized osteopathic course focusing on treatment for the impact of whiplash on the body. The program was developed by French physiotherapist and osteopath, Jean Pierre Barral, and osteopath Alain Croibier. This approach is also helpful for the treatment of various types of injuries including, but not limited to, those causing neck, shoulder, back and hip pain, as well as due to birth trauma. The manual methods utilized are gentle, precise and more like a visceral or mobilization treatment. They do not involve high velocity manoeuvres. Neuromeningeal manipulation addresses the tissues of the container and supporting membranes of the nervous system. For more in-depth information on our Neuromeningeal Manipulation and Visceral Manipulation please visit www.barralinstitute.com. This is an advanced level osteopathic approach for the treatment of restrictions of the soft tissues of the brain and spinal cord. This method was developed by French Osteopathic Physician Dr. Bruno Chikly. Restrictions in the nervous system due to trauma can be reflected in the body. The misalignment that results can be the cause of persistent symptoms. Gentle and precise treatment is directed towards restoring balance in the nervous system, and along with other integrative modalities, reducing or eliminating pain. This approach has been helpful for many conditions, but especially whiplash, concussion, headaches and birth trauma. The brain curriculum addresses the contents (in a way that is different from CST). For more in-depth information on The Brain Curriculum please visit : www.chiklyinstitute.com. VM is a treatment technique that addresses restrictions in the connective tissue systems that surround the organs. There is a continuous link between the fascia surrounding the organs and the fascia surrounding the muscles joints and bones. Thus restrictions in the visceral fascial systems, due to either surgery or trauma, may affect spinal or pelvic mobility. Therefore, treatment is often necessary to restore postural balance and muscle function (from the visceral manipulation position statement, Nova Scotia College of Physiotherapists). For more in-depth information on our Neuromeningeal Manipulation and Visceral Manipulation please visit www.barralinstitute.com. Fascia is a normally mobile connective tissue web, which travels continuously in 3 dimensions from the head to the feet. Think of a 3-dimensional sweater. Trauma, poor posture or inflammation can bind this connective tissue down, resulting in excessive pressure on nerves, muscles, blood vessels, bones, joints or organs, and loss of mobility. This connective tissue is part fluid and part elastic, which is why a slow, gentle and steady treatment force applied over a period of time is necessary to restore motion. This gentle force is applied slowly and gently, into or away from tissue restrictions in order to release them and decrease pain and dysfunction. Qi Gong is a whole body moving mindfulness exercise allowing the individual to let go of tension and stresses in a deep way. It is in keeping with Chinese medicine principles, but was discovered and developed through direct insights and investigation into healing at a deep level by Master Yap Soon Yeong of Malaysia. Master Yap is a licensed therapist with the Federation of Chinese Physicians and Medicine of Malaysia. Brian is a certified instructor who teaches this gentle, yet powerful healing approach to patients on an individual basis. 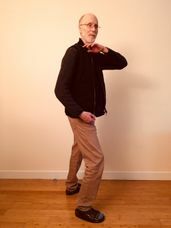 For more in-depth information on CFQ Qi Gong please visit : www.cfqcanada.com.